Most people, especially those in the music industry, would like to be Nashville bound. Not many, if any, of the Milwaukee Brewers would enjoy this trip. Their AAA affiliate, the Nashville Sounds, play in Music City. 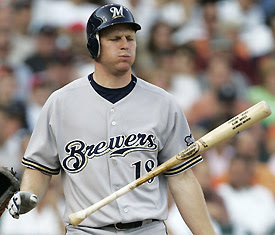 Yesterday my good friend Gabe Gross was optioned to Nashville from the Brewers. When I read the news in the "TRANSACTIONS" column (which is daily reading for me...being in a sports ministry), I was disappointed and a little angry. Gabe was not getting the playing time in Milwaukee that he deserves. At least in Nashville he'll get in a good groove and show the powers that be just how good an all-round player he really is. Am I biased? Yes! Do I have a reason to be? Yes! He is a good player. He was the Toronto Blue Jays # 1 draft pick several years ago. MILWAUKEE -- The Brewers' pitching staff grew to 13 strong on Saturday, when reliever Chris Spurling was reinstated from the bereavement list and little-used outfielder Gabe Gross was optioned to Triple-A Nashville. The team opted for an extra arm because Ben Sheets is on the disabled list with a finger injury and the team is in the middle of a stretch of 18 games in 17 days, including a doubleheader in St. Louis next weekend. Gross had played only sparingly. He was hitting .202 in 55 games, but got only 18 at-bats in June and 17 at-bats in July. "Hopefully I'll be able to go down and get some at-bats," said Gross, 27. "It's been two years since I've been able to play every day, so that's going to be nice. I'm looking forward to waking up every day knowing my name is going to be in the lineup." The Triple-A Sounds are on the road, so Gross will travel to Nashville on Monday to join the team beginning Tuesday. He vowed to make it back to the big leagues. "I have never been more confident in my ability to play every day," Gross said. "I feel like if you put me in the lineup on the first of April and take me out the first of October, that my numbers won't just be adequate, they'll be very good. I have to convince somebody to give me that opportunity." Back on June 18, the Brewers faced a similar decision but opted to keep Gross over Tony Gwynn Jr., who was sent to Nashville to get at-bats. Gwynn had since returned to the Majors and was kept this time around, according to manager Ned Yost, partly because center fielder Bill Hall is on the disabled list and Gwynn is a true center fielder. Hall said Saturday that he expects to be back in the lineup Wednesday in Cincinnati, at which time the Brewers will have to make another roster move. If they stick with 13 pitchers, Gwynn may have to go back to Nashville again. "It's real important to us that Gabe Gross and Tony Gwynn are swinging the bat, because we're going to need them in September," Yost said. "They can be a big part of our bench and can win ballgames off of our bench. They're both young players and it's difficult for young players to stay sharp not playing every day."